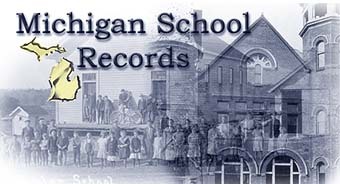 Michigan's school records are an excellent tool for genealogical research. They allow you to place a person in a time period, sometimes names of parents and guardians can be obtained, and it allows you to round out a family member's history. People have been donating materials and time to type data out for Michigan researchers and are included here. The records in this area can be school censuses, records, yearbooks, and commencement programs, reunion records, alumni lists, fraternity records, enrollment records, to name some. During Michigan's infancy schools were located in more populated areas for the most part and ran by the various religious denominations if someone was available. The public school system took hold along with the coming of statehood in 1835. The first constitution created the position of Superintendent of Public Instruction and land was set aside in each township as school land or university land. As the years went by one room schools in the rural areas were added and the graded school were started in towns and villages. Later the one room schools ran as a graded school. Yearbooks became popular in the late 1800's and are a good source in genealogical search. There are also newspaper lists of students graduating to the next year or level in schooling. There were also records kept at the township level by the Superintendent that recorded each student in a school census, which gives varying information. As record keeping became more standardized records shifted to the school district level which the Superintendent oversees. Copyright © 2019 all rights reserved on web page coding and graphics by Michigan Family History Network. Volunteers hold copyright to the material they have donated for this site. Not to be copied and used in any format to any other site or in any other media including CDs, books, and visual presentations. Small parts (not all one surnames studies) may be used in personal family genealogies. Please cite your source (this site) when using this data.